As from today onwards Flax – Mill is stocking, selling and promoting – on these shores and through our outlet in Germany – “Earthed” (by Wm Clark). The unique digitally printed fabric (linen and linen-cotton – union) for home-interior use is the only product in our range which has not been manufactured here at Co. Derry’s only active linen-weaving mill. Why are we making this move which some might call “against our principles”? In these days of globalised streamlined mass-production really original products have become a rarity. Even glossy advertisements in the “high end media” can barely cover up the fact that for example the components for executive limousines are made in the same Chinese factory as the ones for the low-priced small car – the same goes for furniture, tools, household goods… all aspects of life are influenced by the seemingly unstoppable trend towards “cheap and nasty”. Textiles – clothes as well as fabrics for interior use, table-ware etc. – are probably hardest hit by this development. After the murderous factory collapse in Rana Plaza / Bangladesh 4 years ago which left over 1.100 workers dead, all the so-called “up market brands” denied having anything to do with the death-factories in a country which has lost more workers during the last 8 years than Northern Ireland in 3 decades of “the troubles”. When investigating journalists and other people who were looking for the truth searched through the ruins every one of the denying firm’s labels were found! In a scenario like this where low costs and high profits (or the search for them) seem to be the sole driving force for manufacturing anything anywhere, is a high-quality, locally made (as opposed to imported and labelled “local”), professionally designed and finished to high standard fabric possible at all, is a concept like that of “Earthed” doable or will it end up – like many good attempts by many well intending people – being “just another good idea” of Wm Clark’s creative director Duncan Neill? 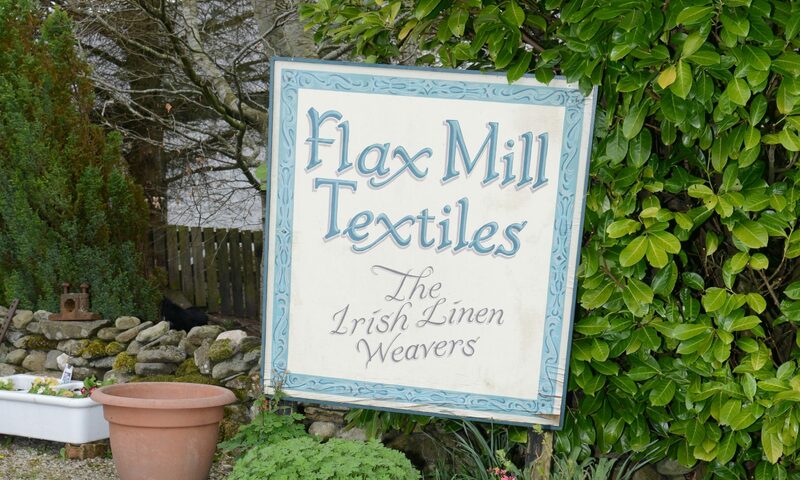 Here at Flax – Mill we know well – maybe too well – what it feels like to try and “do your own thing” in textile-manufacturing. I recall all the “nice idea but will never work in these times….” type comments from the “powers to be” inside and outside the industry when I went back to full – time – weaving (then with one handloom!!) 20 years ago. I remember the arrogance with which the “Irish Linen Guild” (not to be mixed up with the “Ulster Guild of Spinners Weavers and Dyers” we are member of now) told us “…no new members accepted…” and I often think about the strange looks I got from other craftsmen and –women. There was an exception (one just): Wallace Clark who encouraged us right from the start and right until his injury stopped him from operating. “….We have to keep this going…” – they were always a bit different in Upperlands! When Duncan started “Earthed” in 2016 I saw the massive mountain he and his colleagues at Clarks had to climb. I knew that he was going to make many mistakes. I knew that he was going to be frustrated to find the broken infrastructure, the near enough total absence of linen-spinning, the far too small number of weavers…. The fact that for the heavier type cloth (upholstery) he has to use a union of 56% linen, 34% cotton and 10% polyamide to enable the end-product to be capable of sticking 40 000 rubs (the highest standard for upholstery – fabric) is in my opinion due to the absence of good enough linen yarn. We have some of it here at Flax – Mill but the people who spun it are no longer operating and we couldn’t guarantee continuous supply at this stage. The fact that natural dyes are not used in the printing is due to the lack of manufacturers of them on these shores….I could continue this list. But I also saw from when he showed me the first prototypes the uniqueness, the striking beauty, the vibrant energy of the product! And I knew that he had thrown his anchor in the right haven – with the “slightly different” crowd at Upperlands. It took us almost 2 years to decide about taking “Earthed” on board. The final push was given by a young, highly qualified tailor from Berlin who spent time at Clarks doing work-placement. His trust-worthy judgement on the “workability” of the fabric – he made a jacket from “Earthed” cloth which will be shown for the first time at our Fashion Show on Sept. 8th – was the final piece in the puzzle. The readers of these lines know that we know how to make good cloth and a few good finished products from our cloth here at Flax – Mill! We wouldn’t dream about taking on a product unless it is top of the range in more aspects than one. 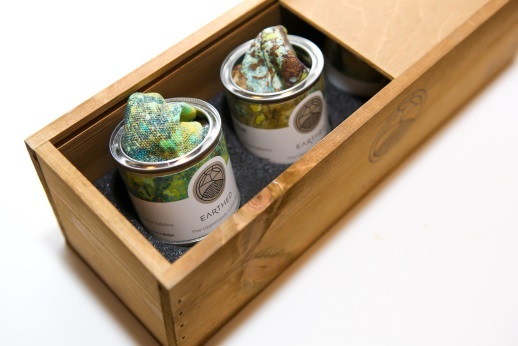 “Earthed” is that – come to visit us at the Flax – Mill and let me introduce it to you!